Ambition is a crucial thing to become successful - but the idea is the core. It is one of the hardest and most aspiring things to do: Participating in a competition and match own creative ideas with the ones from others. You will never know and always be wondering if there is a company doing better stuff than you, being more innovative or simply have the better ideas. What a better opportunity to find out than just give it a try, compete in a contest and see what happens?! At the Thuringian founder’s prize competition you have the chance to participate in three different categories (the business plan, successful startup and felicitous company's succession) and compete against other companies. The variety of industry sectors which are partaking is high and every industry sector is welcome. 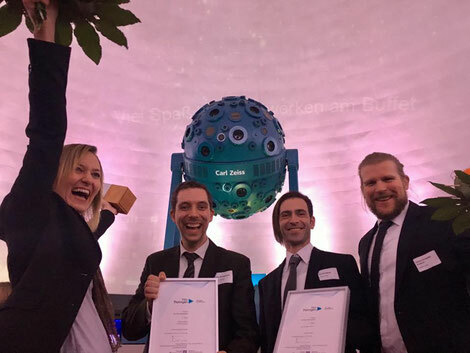 And as a young and innovative technology startup we’ve been doing exactly that – been ambitious and took part in the first category: the business plan. 67 different companies have been actively taking part in the business plan category of the contest with lots of diverging concepts. The best three companies were awarded and given prize money. And we can now proudly tell you that we’ve made the second place in the business plan category which was endowed with 7.500 Euro - just after the Redwave Medical Company which has been the winner in this category, congratulations to them as well! The awards ceremony was held at the 30th November 2016 and it was a great pleasure and a phenomenal evening for us! At this point we would also like to say great thanks to the judges and the prize that was sponsored by the ThEx.